One of the biggest improvements Apple fans will find in the just announced iPhone 6s and iPhone 6s Plus are superior main cameras. We start off with an 50% bump in resolution — from 8-megapixels to 12-megapixels — supposedly without any sacrifices in image clarity. 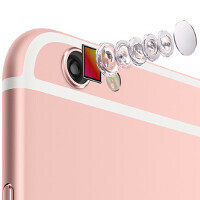 Like before, the smaller, 4.7-inch iPhone 6s comes without optical stabilization, while the iPhone 6s Plus features one (and now it works for video). 4K UHD video capture will also be made available, along with humongous, (up to) 63-megapixel panaoramic photos. Obviously, it'll be a while longer until we can get our hands on full-sized photo samples shot by us, but until then we can use what Apple made available on its own official Photo Gallery page for the new iPhones. Keep in mind that due to bandwidth concerns, Apple has re-sized the photos so that they load faster in your browser, so don't jump to any conclusions just yet — the real thing will offer much higher resolution. I hope it beats the kings, the Samsung Galaxy S6, S6 Edge, S6 Edge+, & the Galaxy Note 5. I would hate for it to be obsolete from the get go. Its not. There is no way a 12MP camera is going to stand up to a 16MP camera with 1.9 Aperture, even if that 12MP camera has a 1.9 aperture. Megapixels are only a small part of the equation. F/1.9 is awesome for low light and depth of field, but how the image is processed between light hitting the sensor and it being stored on memory has a big impact on that final, heavily compressed JPEG. Image processing affects the image in many ways. Having RAW support eliminates that automated image processing, allowing the user to alter the image how they see fit. Samsung is still going to be on top due to RAW support. images are pretty good, apple in known for utilizing old tech at optimum level. Kudos to apple for their software. These photos are surely taken by professionals. Will wait to see real life comparisons. There's also the fact that some Android phones now have support for RAW. So even if the processing for the iPhone is superior, that can be countered by those who are so inclined. However, by going with a lower resolution, they do maintain slightly larger pixels on the sensor. Not by a large margin as it seems they're still using a standard smartphone sensor size. TechieXP1969 your post clearly shows you have no understanding of how a quality camera works. A high megapixel count does not necesarrily make for a better quality picture. Nor does a larger aperture. Do you even know what these are. I suggest that you do more research on camera tech before you make such statements! What are you? 5 years old? What you said has nothing to do with the quality of a picture. Megapixels (MP) has to do with the size of the picture not quality. iPhone 6 plus beats Note 5 camera already with 8MP I saw the camera comparison on YouTube even the 1.2 MP ffc of iPhone 6 plus better than Note 5 and S6 5 MP ffc. Are you crazy man? Don't know what video you've been watching, but no chance in hell the 6 Plus beats the Note 5. You're probably just one of those fanboys who refuse to acknowledge the cold hard fact that iPhones no longer have the better camera, if they ever were better. Now people will stop saying 4K is unnecessary/nobody has a 4K display, etc. No, no. It's still utterly useless. We don't have the internet support nor the content availability. You can't even get true 1080p content completely from your tv provider. You have no clue like many noobs. 1. Even on 1080p screen 4K video will be downscaled and LOOK better. 2. Youtube 4K videos, upload in much higher bit rate (quality) then 1080p, and offering like full 1080p quality on your 1080p screen, instead of 1080p uploads which looks like 720p or even worse, also the sound is much better in 4K 320 vs 192kbps AAC. 3. Educate your self. Same sensor size, more pixels. Only advantage Apple had previously was bigger pixel size - 1.5um Now that is also gone, now it;s only 1.22um, almost same as Samsung/LG etc., Same aperture. With smaller sensor and narrow aperture, I don't think they can do any good compared to other cameras. Should be. No official word, though. Any mention of ram, split view, slide over, and picture in picture? Is there a link for that? Where did you get the info?